to the arrival of the Portuguese in the Kerala coast and the establishment of their hegemony over the then native Syrian Christians, the latter enjoyed all the privileges and social status of the non-converts. Occasional convertions to the Christian faith also continued during this period on account of different reasons like the influence of their converted kith and kin miraculous experiences, rivalry between the non-converts and the differences with the rulers and the sub-ruler cliques. Such conversions were non-events and did not create any social commotion. The rulers of the day were, to a large extent, unconcerned even about the conversion of some of the temples into churches when the converts had decisive controlling authority over such institutions. Prominent among the many Hindu temples which lost their important followers by their conversion to Christianity was a historic and ancient one situated in Thiru Moozhikulam. 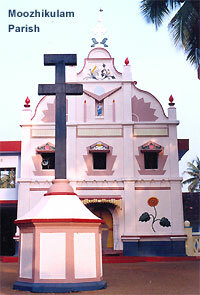 The Christian family of Panikulam is believed to have originated by the acceptance of Christian faith by one of the few principalities who controlled the administration of this temple. The exact cause for the conversion and its time are unknown. †However, according to the documents available in the St.Mary's Church Moozhikulam, this ancient church was established in the year 601 A.D. and its 6th vicar was Rev. Fr. Ittoop from Panikulam family. It can, therefore, be safely assumed that the conversion of the family to Christianity had taken place during the 7th century A.D. or earlier. There is a large area in Elavoor near Moozhikulam comprising of an impressive pond surrounded by a stretch of paddy field on one side and coconut farms on the other three sides known by the title 'Paranikulam' and inherited by the present generation of the family. It is learnt that the pond was once a private bathing place adjoining a princely mansion protected by a fort. The fort as well as the steps leading to the pond were made of polished stones and the removal of their remains for use elsewhere is vivid in the memory of the living members. It is believed that the inhabitants of this princely mansion were the Hindu ancestors of the Panikulam family. The original title of the family during its Hindu days is understood to have been Paranikulam which by the passage of time got abbreviated to 'Panikulam'. The Christian Panikulam family thrived in Moozhikulam. The members are settled in the adjoining localities of Elavoor, Kunnappillissery, and Parakadavu all of which once formed parts of Moozhikulam parish. The first recorded migration of a family member from Moozhikulam areas is the settlement of Joseph S/o. Kunjuvareed in North Parur around the year 1750 A.D. His movement out of Moozhikulam was, as per tradition, prompted by some conflict with the local 'Naduvazhi'. From North Parur the family spread out to Ambazhakad, Kattoor (two wings) and Thundathukadavu and from Kattoor to Edathurithy. The second part of the book is the history of this Parur branch. The second recorded movement out of Moozhikulam is of Kunjicheria, S/o. Mathai who on marrying Rosamma D/o. Mr. Varky, Alakkat Kannampuzha settled in Puthenchira around the year 1825 A.D. There were few more movements of members out of Moozhikulam. However, considering the limited number of members involved, their history has been recorded as a part of Moozhikulam branch itself. †Ref. P.195 and 196 of "Ernakulam Athirupatha Avalokanam" by Rev. Fr. Jacob Erannat - 3 Dec 1978.